Thursday August 16th 1883 Mother and I worked all the forenoon making jelly. Mother went to town in the afternoon. Ott and Lee both went to Aunt Ems to a party. Rob and I were up to Mifs Congdons to a musical entertainment. Aunty Walker came over to stay all night. 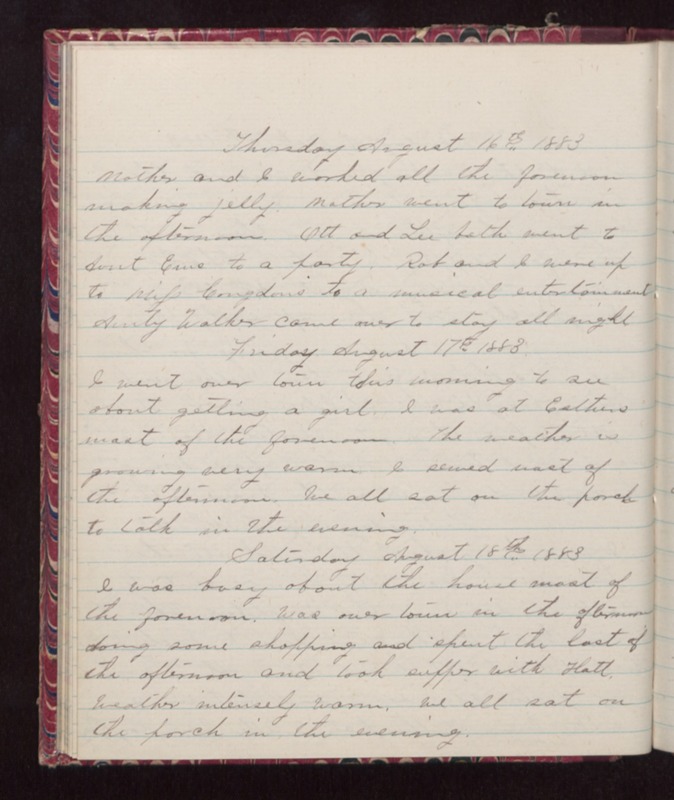 Friday August 17th 1883 I went over town this morning to see about getting a girl. I was at Esthers most of the forenoon. The weather is growing very warm. I sewed most of the afternoon. We all sat on the porch to talk in the evening. Saturday August 18th 1883 I was busy about the house most of the forenoon. Was over town in the afternoon doing some shopping and spent the last of the afternoon and took supper with Hatt. Weather intensely warm. We all sat on the porch in the evening.